“Walking Through The Fire” Socks Pau! 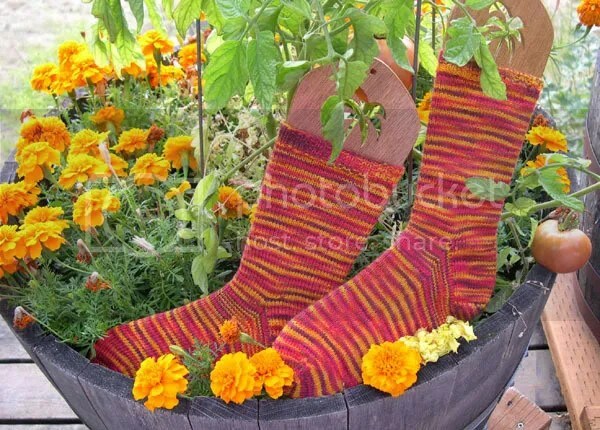 I have been working really hard getting these socks done, and finally, last night, I grafted the toes on each sock, wove in the ends, and stopped to admire them. These are the first socks I’ve ever knit on sock yarn. It’s been a challenge, but I’m pleased with the results. I know I will knit more, as evidenced by my sock yarn stash. I knit these on bamboo needles, which got warped during the process, but as we say in Hawai‘i, “Ainokea!” [I don’t care.] They are old friends now, and I will keep using them. Walking through the fire. We all have our tough times, and these socks speak to me of walking through but eventually coming out on the other side. We don’t stop in the middle. “Mokihana’s Palm Tree Sock Blockers” by Chappy. I think they look great with tomatoes and marigolds. It’ll be harder to photograph finished objects during the gray of winter! 19 Responses to “Walking Through The Fire” Socks Pau! Mahalo nui, Blue!! 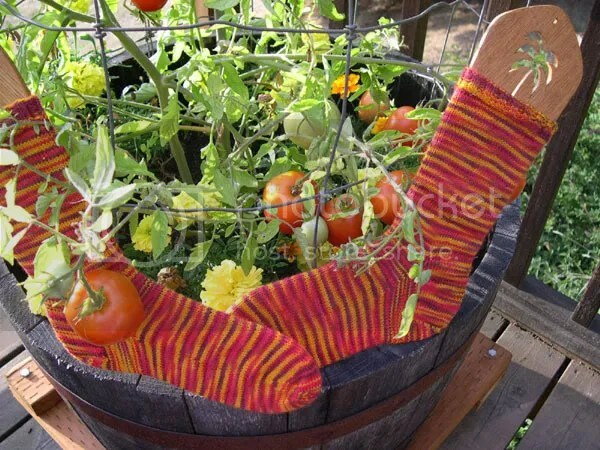 I thought the colors of the tomatoes and marigolds were perfect for photographing the socks! I love your sock blockers are there any with honou they are my favorite. Thanks so much! I have heard wonderful things about Isle Knits. The next colorway I’m working on is Lorna’s Laces “Hawai`i” Colorway. Thanks for stopping by; I really appreciate your comment. Gorgeous! The colors are bautiful and the socks look great. Congratulations on your walk. Thanks! The whole process was kinda walking through the fire! Mahalo, Sheena!! Eh, u gotta learn how foa knit so u can make moa sockies! Den hand wash so da washa no can eat um up!! The socks and the photographs of them are very na`au. Nice job! 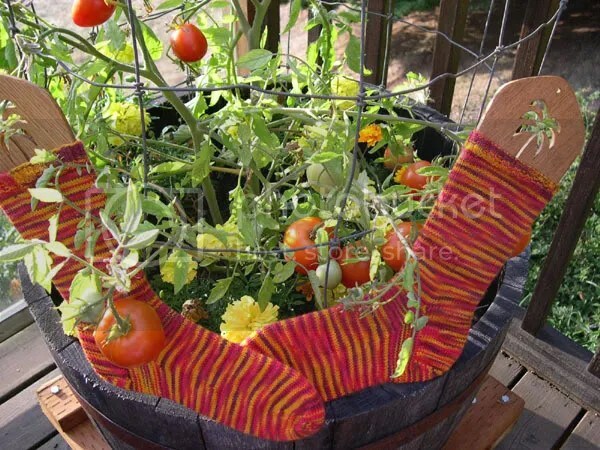 Love the color and pattern and, yes, they do look great next to the tomatoes and marigolds. Way to go! Love the socks! Your pictures are very creative and beautiful. your socks are beautiful…and Ilove the way you photographed them! I love the concept and the wonderful little ‘sermon’ most of all in the making of the socks. How many times we have to walk through the fire, and oh brother, how many times do I burn my poor little toes because I’ve stopped in the middle. Sometimes because of discouragement, curiosity, stubbornness, becoming faint at heart… But you are so right, to proceed through without stopping means we only get to the beauty quicker! Keep knitting Sista! Awesome job! So nani! I love dem! Almost makes me want to learn to knit!